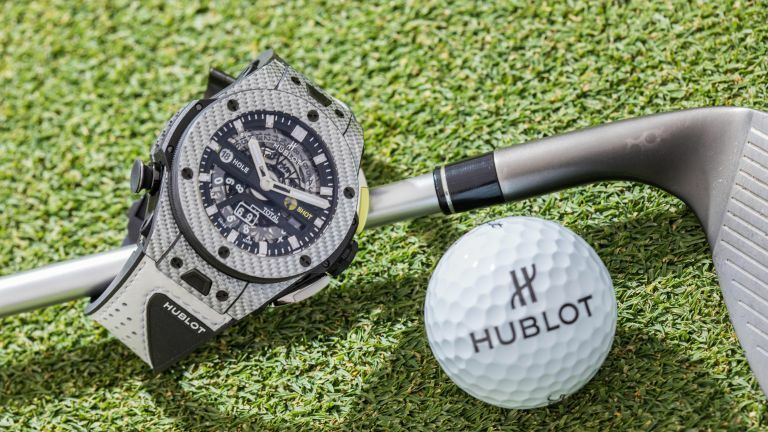 Hublot has joined forces with Dustin Johnson (world #1 Golfer) to create the ultimate timepiece for golfers – the Big Bang Unico Golf. It allows golfers to seamlessly calculate their score whilst on course. The watch features the MHUB1580 UNICO movement, designed, developed, manufactured and assembled by Hublot especially for this piece. The putter-shaped pusher at 2 o'clock activates the mechanism for displaying the number of strokes taken and counts the strokes per hole. The pusher at 4 o’clock allows the wearer to move on to the next hole by resetting the stroke counter to zero. The counter at 6 o’clock displays the total number of strokes played and is simultaneously updated. The pusher at 8 o'clock is shaped like a tee. This resets the mechanism and sets the counters to zero at the end of the round (this can be locked to ensure it's not inadvertently pressed during a round). The Big Bang Unico Golf's case is carved from Texalium, a mixture of carbon fibre and aluminium which is exclusive to Hublot. That means the watch weighs an impressive 97.93 grams. The Golf comes with two interchangeable straps which can be easily switched with the One Click system. One strap is made from rubber with white leather sewn on (designed to look like a golf glove, which it is very successful in doing), while the other is made from technical fabric with a Velcro fastener for ultimate comfort while playing. The piece comes in an official presentation box with Hublot branded golf balls, tees, and a towel. Try not to lose them in the rough!